The "Hash House Harriers" (HHH) are a loosely-knit international group of runners and cyclists with chapters in over 160 countries around the world. 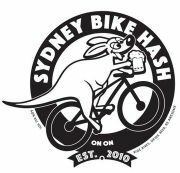 The Sydney Bike Hash conducts monthly rides ("hashes") around greater Sydney. A typical bike hash involves one or two members ("hares") marking a "trail" using chalk arrows through cycle ways, roads and trails for the "pack" to follow on their bikes. Trails leave from a pre-arranged starting point, typically via two or more pub stops, to a pre-arranged ending point, where the beer and drinks and nibbles are! At the end, a "Circle" will be conducted where the ride will be reviewed and "charges" will be bestowed for various misdeeds on trail. Trails are anywhere from 10-20km depending on the hare, but are designed to be completed in a few hours (including pub stops). Bring your bike, helmet, water, lock, and $10 for the ride. We go out for a meal at a local pub after the ride, so bring more money if you're coming to the "On Inn". In winter you may be returning home after dark so it's also a good idea to have lights on your bike.